Page of Swords says that the activities surrounding you are causing you concern. Begin to align your verbal commitments with action. Regenerate your thinking and act on your ideas rather than just talking about them. Remaining fixed on “old” knowledge may block new understanding. You learn from everything – every experience, every moment is new. Investigate the possibilities. Trust your intelligence and give your mind a chance. Find a way to attain your goals and dreams. Learning never stops – break through old conditioning, old values and beliefs. Be receptive to other peoples moods, so that you will KNOW when they are on the defensive. You may not like the possible delay in plans, you could even receive news that you will consider disappointing – news not necessarily instigated by you, but affecting you and requiring quick decisions, causing you to act immediately. Rise above your problems – detach yourself from them, rather than trying to meet the opposition head on. Explore new ideas, seek new realizations and insights – continue to grow. Mental, assertive, alert, thoughtful, impressionable, investigative, curious, vigilant – ruled by the drive for transformation. Drive and the forces of change is instinctive, passive, automatic. Insightful, highly active consciousness, probing, mentally playful, mental innocence, purity – appropriately naive in mental affairs. Lack of mental experience. The transformation side of things mental, representing new intellectual opportunities, situation, events and guides. Learning lessons directly from mental interaction – mental renewal, mental news. The fountain of mental youth which keeps our minds from aging just as the fountain of influence serves to keep our bodies young. What fears must you face? What have you just learned through the media? Who is trying to communicate with you? In the first position: Like the Page of Pentacles, yours is a world of constant discovery. But you use principally your mind for your adventures and to collect your souvenirs. Whereas the Page of Pentacles turns his/her real world into a fantasy, you are capable of turning your fantasies into the real world. In the second position: This is the advantage of the general who has the best reconnaissance team, the calvary officer with the best advance scout. Contemporary society is the age of information and you have what you need at your fingertips. Collection and dissemination of information may be your business. In the third position: This child is coming to you in person or sending its lessons through other signs in the Mental Plane. Accept with open arms the changes that have come to your mental house. In the fourth position: Here can be seen the love of the air spirits that enliven the mind, the fairies. This is a love of God in the winds and the heights of the Earth, the passion of the flyer and the mountain climber. Here, too, is the love of novelty, of revelation, seen in plan for a new invention, seen in the eyes of the most experienced when they discover the concept of the matter, the mind of God. In the fifth position: This page has your attention, either in person or influence. It has brought renewal and the potential for a whole renaissance of activity, a different phase to your mental house. 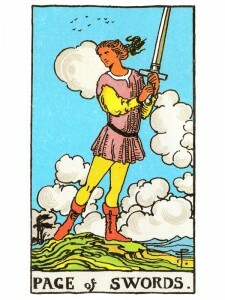 In the sixth position: The Page of Swords may be arriving in person in the near future. Person or not, the influence here is to reinvigorate the heart with the mind’s innnnnnnocence and purity and draw support for mental change. This generates new possibilities in existing relationships and/or new relationships/ creativity. In the seventh position: Your mind will be on this Page in the near future. You are pulled more and more to the element air and her ways as you listen to her spirits of the wind – the sylphs – your guides. The mind is called on to invest in the future by embracing youth principles in the Mental Plane. In the eighth position: This youth is in your physical house. You are learning lessons directly from mental interaction that will change your material affairs, even your attitude and approach to your health and appearance. In the tenth position: Here is the youth, the freshness and purity, the new resources you need for your program in the Mental Plane. It may well come to you in the personage of the Page of Swords. It may, however be the access to what he/she represents.